Racing themed rodent is Biostar's third mouse. If we asked 10 people to rattle off a list of gaming peripheral companies, there's a good chance that Biostar wouldn't get a single mention. That's because Biostar is best known as a maker of budget motherboards, a category it's been competing in for many years, though it now has a small and growing line of gear for gamers. The newest of those is the GM5 mouse. 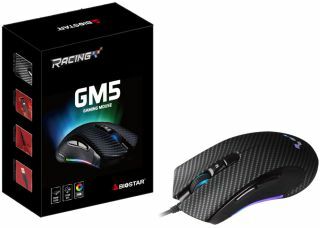 The GM5 is Biostar's third rodent. It's also what the company considers its flagship mouse and is priced accordingly at $40. Biostar's other two mice, the AM3 and AM2, are priced at $16 and $10, respectively. Even at $40, it's a pittance compared to flagships from competitors like Razer and Logitech, though it's also comparatively thin on features. It lacks amenities such as removable weights and modular pieces. What it does bring to the table is a 7,200 dpi PixArt PMW 3330 optical sensor that can be adjusted down to 50 dpi. Users can program four preset dpi settings—by default they're set at 800, 1,600, 2,400, and 7,200. Biostar says the GM5 is designed for gamers who favor the claw grip. It's also an ambidextrous mouse with 8 programmable buttons featuring Omron switches and five modes. Like the AM3, the GM5 falls under Biostar's Racing series of products. This one is themed with a carbon fiber finish and racing logo, the latter of which is one of several parts featuring RGB illumination. The other places that light up include both sides and the scroll wheel. Biostar did not say when the GM5 will be available to purchase.